The face is a snow guards primary feature as it is where the stopping power is derived. We offer one of the best collections of snow gaurds on the web! On our site you can find every type of snow guards you may be looking for. Also be sure to read the rest of this snow guard buying guide. 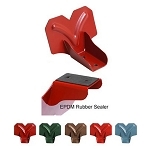 Clamp on snow guards are a good option for those who have a standing seam metal roof. It is the most popular kind of snow guard. This type of snow guard does not penetrate the roof, but is attached mechanically giving it a lot of holding strength and can be attached during any season. Check our shop for both metal and plastic snow guards. Panel valley snow guards offer an option for roofs where clamp on snow guards will not work. These offer two styles of attachment methods. 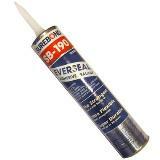 Adhesive attachment that does not penetrate the roof, and mechanical attachment that can be done any time of the year. Check our store for both metal and plastic snow guards for valley panel roofs. For home owners and contractors who are new to snow guards it is always best to consult with a professional who has experience installing snow guards. By consulting with a professional you can ask questions and get tips that you may not have originally thought of. It is also very important to truly understand the type of roof you are installing snow guards on. Some roofs that appear to be a standing seam metal roof are not truly standing seams, batten roof systems are often mistaken this way. When choosing snow guards, the main question you should certainly NOT be asking yourself is, "How can I get away with the least amount of snow guards?" You need to be aware of the fact that you should not just place snow guards over door entrances and garages, but that snow guards need to be placed on the entire length of the roofing system. Sometimes you can get away with using fewer snow guards if you have a break in the levels of your roof, but it is truly best to place them on the entire roofing system. Your home is an expensive investment and using proper snow guard calculations can save you a lot of head aches. What style is my metal roof? The standing seam metal roof is a great candidate for the clamp on style snow guards. With the other styles of roofs, you will want to get a panel snow guard. How many snow guards do I need? Calculating the number of snow guards you need relies on several factors including: snow guard style, roof pitch, length of roof, length between the eve and the ridge, snow load and more. Several snow guard calculators can be found online including this one - Snow Defender Snow Guard Calculator. Most snow guard manufacturers can answer any questions you may have about the number of snow guards you need to have a proper install for your roof. A couple things to keep in mind here are the steeper the pitch, the more snow guards you will need and the smaller the snow stops the more of them will be required. Roof pitch is often spoke as two numbers. When you here someone say, "My roof has a pitch of five twelve" this means there roof rises 5 inches for every 12 inches it runs. In more simple terms, if you start at point A and move to point B one foot away, you will be 5 inches higher. You can determine roof pitch either on top of the roof or on the bottom. 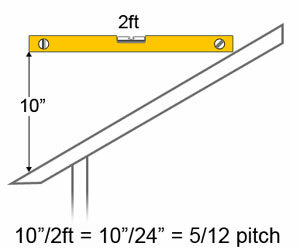 Use a level marked at 12", hold it level and then measure the distance between the roof top and the mark on the level. If it is 5 inches, you have a 5/12 pitch. Use a level marked at 12", hold it level and then measure the distance between the roof bottom and the mark on the level. If it is 5 inches, you have a 5/12 pitch. This method can be down on a rafter, the underside of your attic, or on the end of our home. It is also a little bit safer because you do not have to stand on the roof to measure the pitch. How much am I willing to pay for snow guards? In general, mini snow guards truly don't save money because this style requires about twice as many to achieve the same stopping power. The mini snow guards are useful in situations where there is not much clearance or you want a low profile snow guard. Some people prefer to purchase metal snow guards with the thought in mind that the metal will last longer than the polycarbonate plastic snow guards. Advances in technology for polycarbonate have really narrowed the gap between plastic snow guards and metal snow guards to the point that with a snow guard cover, you will get as much life span out of a plastic one because the metal snow guards will rust. The decision to go with metal vs. plastic should come down to which look you prefer. One thing many people do not realize is that plastic snow guards are made from the same polycarbonate material that airplane windows are made from. Professional Roofer - Comfortable with many styles of roofs. Owns the proper equipment to install snow guards safely and quickly. Is licensed and insured to be up there. Do adhesively attached snow guards really work? With the advancement of adhesives over the last few years, adhesively attached snow stops have become more and more reliable. When used properly and according to manufacturer specs, using an attachment adhesive such as SureBond-190 will ensure that your snow guards will not fail. If you are still skeptical about using an adhesive, you can always use screws and attach the snow stops to the roof mechanically. One advantage of using an adhesive over mechanically attached, snow guards is that if a freak snow storm occurs and your snow guards need to give way because a snow load is just too much, adhesively attached snow guards will give way with a lot less damage to the roof. They are also able to be reattached when the snow melts and you find them all in your front yard. I have an EPDM rubber roof, can I use snow guards? The first thing to do if you have a rubber roof is to make sure that attaching snow guards to your rubber roof is not going to void any manufacturer's warranty. Once you are ok with installing snow guards on an EPDM roof, you will want to consider plastic snow guards that can be attached with an adhesive. Peel and Stick snow guards are available, but using an adhesive like SureBond-190 is a much better adhesive when attaching snow guards to a rubber roof.